With 1957’s 12 Angry Men, we look at an unusual kind of drama – one set almost entirely in a single room. We view a jury as they go to deliberate a murder case. If they find the defendant (John Savoca) guilty, they condemn him to death, since that’s the only punishment applicable in this situation. For 11 of the jurors, this seems to be an open and shut case. They quickly decide that the kid did the nasty deed and should be found guilty. However, Juror #8 (Henry Fonda) takes the judge’s (Rudy Bond) instructions to heart. He thinks there’s a reasonable doubt about the kid’s guilt and argues this line. Since the verdict must be unanimous, this creates many arguments. The movie follows the tensions as the 12 jurors deliberate over the case. 50 years after its release, Men remains influential and impressive, though it does show its age at times. Adapted from a 1954 live TV production, the framework that binds the characters to the single room acts as both a strength and a weakness, though the positive elements dominate. I think the setting increases the tension inherent in the story, as the tightness and claustrophobia prevent too many opportunities for release. Even when the characters take a short break from deliberations, they still get stuck with each other in the confined space. They can’t escape each other for more than a couple minutes at a time, and that amps up the tension. On a negative note, though, I think the setting requires director Sidney Lumet to adopt a few showy bits that don’t seem very natural. For instance, when Juror #10 (Ed Begley) releases all of his racial hostility, the others slowly leave the table and put their backs to him. Yeah, we get the point; this scene beats us over the head with their body language. It doesn’t feel realistic to me, as it comes across like something very staged. Actually, the racial aspects of Men display its most substantial weakness, and I don’t mean that because all the cast members are white men. Men emerged right as the civil rights movement started to blossom, and it often feels like a product of that era. We get periodic speeches intended to remind us that all men are equal and blah blah blah. Of course, I agree with these, but the manner in which these concepts appear feels dated 50 years later, and the film doesn’t integrate them in a smooth way. They always appear just a little too forced. These are small quibbles I aim at an otherwise strong film, though. Men boasts a simply outstanding cast and conveys its story in an economical manner. We don’t get clumsy exposition for the characters. We learn a little about them in general terms, but the flick doesn’t pound us with those beats. Instead, we simply get a taste for each personality, and the actors make them into real characters. We know almost no specifics about the backgrounds of these men – heck, we don’t even learn any of their names until the final shot – but the movie tells us everything we know if a smooth, subtle way. Lumet also uses the camera well most of the time. Sure, we find some awkward shots like the ones I mentioned earlier, but usually Lumet ensures that the camera acts as a storytelling device. For instance, when confrontational scenes occur, the camera tends to go in for a tight close-up. It relaxes when the sequence dictates. This doesn’t happen in a ham-fisted and obvious way, however. The visual choices mesh with the story and make it more effective. 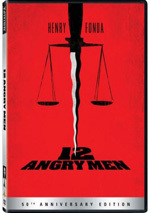 12 Angry Men appears in an aspect ratio of approximately 1.66:1 on this single-sided, double-layered DVD; the image has been enhanced for 16X9 televisions. While some concerns arose, the transfer generally satisfied. The biggest distraction stemmed from grain. Hoo boy, did the movie display a lot of graininess! That was a consistent presence throughout the film, and it tended to make the image a little murkier than I’d like. It mainly affected sharpness, as the presentation never looked particularly crisp. However, I also didn’t think it was soft. Sharpness was good most of the time and always at least adequate; the grain simply meant that it didn’t achieve a high level of clarity. At least no issues with jagged edges or shimmering occurred, and edge enhancement remained minor. Source flaws remained modest. I noticed occasional specks and marks, but not a lot of them marred the presentation. Blacks were deep and tight, and shadows showed good definition. Of course, the grain rendered those shots a bit denser than I’d like, but they still seemed fine. This wasn’t a great transfer, but it seemed strong enough for a “B”. I also felt reasonably satisfied with the monaural soundtrack of 12 Angry Men. To call this an unambitious mix would be an understatement. The track offered very little score, and effects were essentially restricted to the creaks of chairs and the bumps of closed doors. Both sounded acceptable, though they generally were rather thin and without much range. Speech accounted for every important aspect of the mix. At all times, the dialogue was intelligible, but I thought the lines tended to be and a little sibilant and occasionally edgy. Nonetheless, most of the speech was perfectly acceptable. In no way was this a memorable soundtrack, but it seemed satisfactory due to its age and ambitions. Heck, I’m just happy no one decided to give Men a multichannel remix; if ever a film existed that would benefit less from a 5.1 track, I can’t think of it. How did the picture and sound of this “Collector’s Edition” compare to those of the original DVD? Both demonstrated improvements. The audio wasn’t much better, but the new track sounded a little clearer than its predecessor, and it also lacked the minor source noise from that earlier release. As for the picture, this one provided anamorphic enhancement absent on the prior disc, so it boasted greater definition. It also showed deeper blacks and fewer print flaws. The new DVD was a definite step up in quality compared to its predecessor. While the prior release included almost no extras, the CE tosses in a few. We find an audio commentary from film historian Drew Casper. He provides a running, screen-specific discussion that looks at the project’s origins as a teleplay and its development for the big screen, editing, cinematography and visual symbolism, cast and crew notes, social commentary and thoughts about the flick’s era, the set and staging, the score, the film’s reception and its subsequent life. Casper is a commentary veteran, and that experience comes through during this strong chat. He manages to cover factual issues well and he also digs deeper into the movie’s meaning and themes. Casper puts all these elements into perspective to create a consistently interesting and enjoyable commentary. Two featurettes show up as well. Beyond a Reasonable Doubt: The Making of 12 Angry Men runs 23 minutes, three seconds as it provides movie snippets, archival pieces, and interviews. We get notes from director Sidney Lumet, UCLA law professor/Reel Justice co-author Michael Asimow, AFI Executive Editor Patricia King Hanson, film historian Robert Osborne, Court TV anchor Jami Floyd, stage actors George Wendt and Richard Thomas, stage director Scott Ellis, and movie actor Jack Klugman. “Doubt” examines the project’s roots and its path to the screen, Lumet’s approach to the material, cast, characters and performances, staging and camerawork, and the movie’s reception and legacy. On its own, “Doubt” offers a pretty good recap of the production. Since Casper covers so much in his commentary, we get a moderate amount of redundant material, unfortunately. That shouldn’t be seen as a slam on this featurette, though, as it works well. It goes through the relevant issues in a concise manner and satisfies. 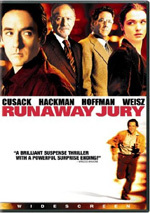 Inside the Jury Room goes for 15 minutes, 28 seconds as it features Floyd, Asimow, attorneys Robert Shapiro and Gloria Allred, trial consultant Michael Cobo, University of Connecticut Professor of Law and Ethics Tom Morawetz, and Robert Blake trial jury foreman Thomas Nicholson. The show looks at the American criminal justice system and its operation, with a specific take on the use of juries. It also relates the reality and liberties of Men. “Inside” provides an enjoyable view of the courts and how they’re reflected in the film. In an odd movie, this CE drops the prior disc’s only extra. The earlier set included the film’s trailer, but it fails to appear here. After 50 years, 12 Angry Men occasionally shows its age. However, it succeeds much more than it falters, and it remains a gripping piece of drama. Both picture and audio are satisfactory to good, and a few useful extras flesh out the package. This is a satisfying release for a fine film, and one that merits an upgrade for fans who own the old DVD.